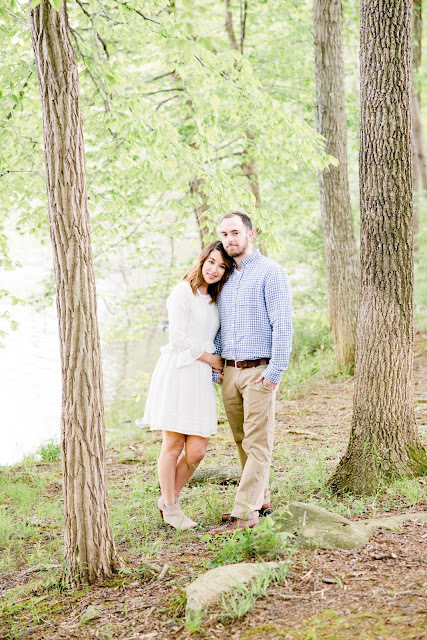 Rosy Outlook: Engagement Photos--What to Wear! 1.) Be the "Best Version of Yourself": If you're not the type of person that wears dresses often or wears prints/patterns, then don't do it for your pictures! Wear a nice top and a nice pair of jeans. Whatever you feel most comfortable in! 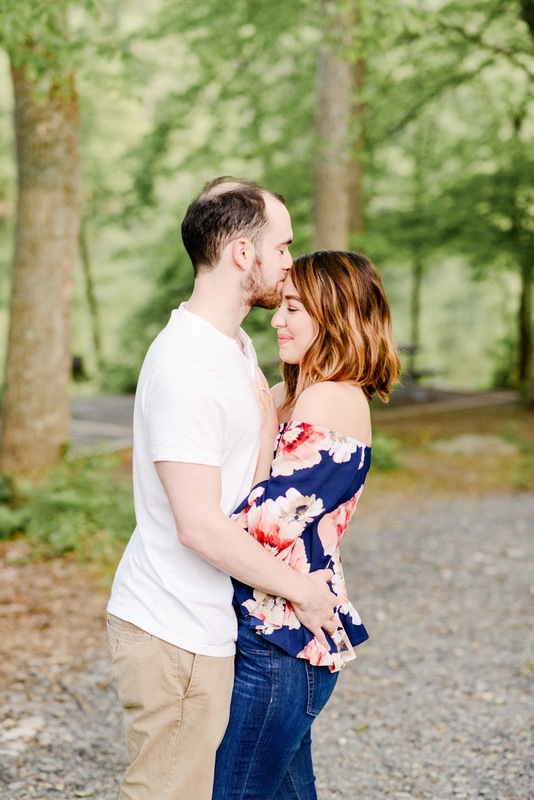 The pictures should be a reflection of your style (and your fiance's) and you want to feel like you look your absolute best. You're not going to feel that way if you're wearing something totally out of your comfort zone. 2.) Pair solids & patterns: As you can see, in each set of outfits Steven and I combined solids with patterns. Combining too many patterns can be really distracting and wearing only solids doesn't give a lot of dimension. 3.) Wear colors that compliment but don't match: Initially I was thinking about having Steven wear navy to match my off-the-shoulder top but when I pictured it, we would sort of just blend together into one blob of navy in the photos and I definitely didn't want that! I wanted him to wear white so it really added some contrast without being too mismatched. 4.) Think about your background: I knew we were going to be photographed amongst a lot of greenery and yellows and browns so I wanted to pick outfits that really stood out against the background. Just be cognizant of your surroundings and don't pick colors that are going to blend in. 5.) 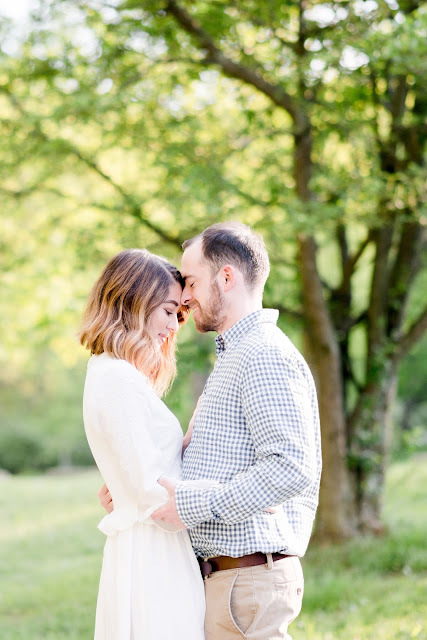 Bring multiple outfits: This might be a little high maintenance to some, but I knew I wanted some photos where we were basically wearing our "Sunday Best" and some where we just looked like ourselves on an everyday basis. That honestly sort of describes our style together because we like to get dressed up when we go out on dates but when we're just spending time running errands together or with family we keep things casual! Also, it's just nice to have some versatility in your photos! 6.) Wear comfortable shoes: I feel like this is a pretty "um...duh" tip but we were doing a lot of walking around to different areas of the park and also you can see we had to trek through the woods to get some shots. Make sure you're wearing shoes you know are comfortable and functional especially if you're shooting outside in nature! 7.) Last but not least is only for the ladies--wear make-up that is going to stand out in photos but also makes you feel your prettiest. Don't go overboard if you're the type of person that just likes natural looking make-up. And if you love getting done up with false lashes and smokey eyes and that's how you feel the most confident, then do that! Make sure you don't wear foundation with an SPF (to avoid flashback in photos) and if you're changing outfits, make sure your eye and lip colors go well with both looks. That's all I have--I hope you enjoyed reading these tips and found some of them useful! Thank you again to Kirsten Smith Photography for the amazing experience and gorgeous photos! 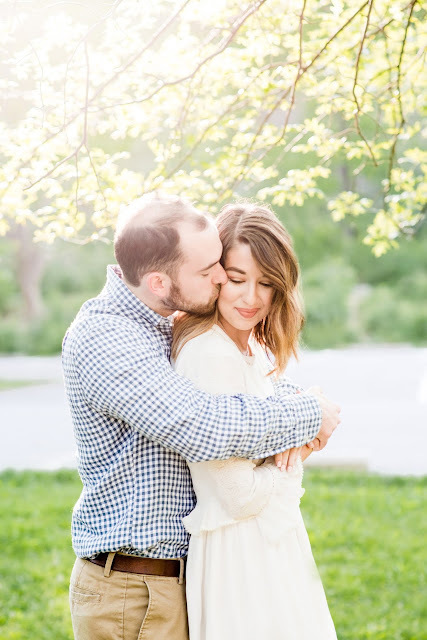 Your engagement photos are so stunning Kelly! Great tips on what to wear! Hope you enjoy your weekend love! Ekkk! These photos are amazing! I love your outfits together too. You look gorgeous! These shots are so beautiful! You look amazing and these are some great tips! You two are honestly the cutest, Kelly! I LOVE these photos and how natural they feel. You can see the love and connection between the two of you, in perfect harmony. 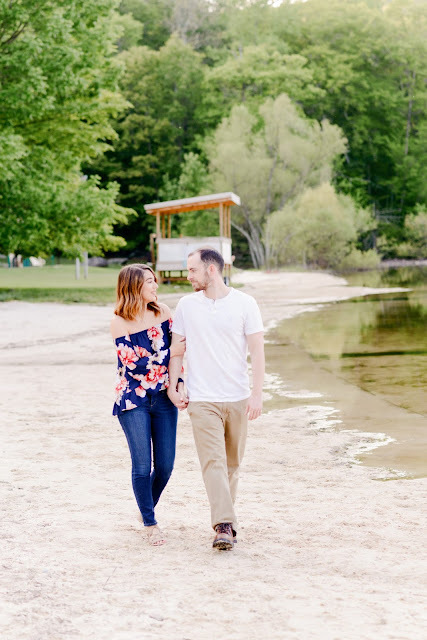 My husband and I didn't' do engagement photos, so I'm not familiar with the whole thought and planning process, so I really enjoyed reading your tips, which I know many planning will find helpful! 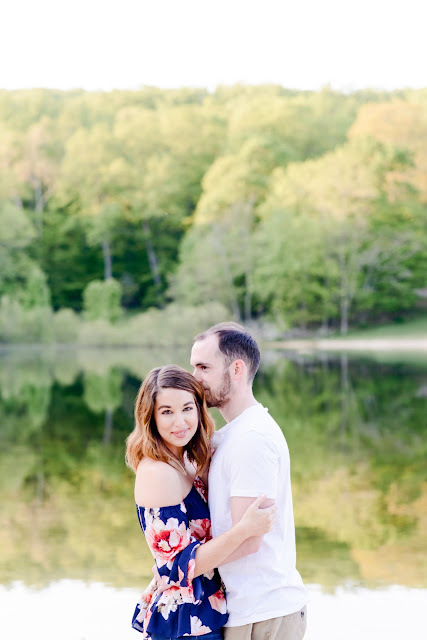 A number of my friends chose themes for their photos, which is fun, but I also like the idea of the photos reflecting the relationship instead of having it be more of an editorial thing. Thanks so much for sharing, gorgeous, and I hope you have the most amazing weekend ahead! So many great tips! Your photos are just too perfect! These engagement pictures are absolutely gorgeous, Kelly! And I love what you picked to wear, that white dress is so perfect. Such great tips, too! Hope you have a wonderful weekend! I just love your photos! Great tips! My husband and I are doing an anniversary/just for fun shoot next week and I'll def be using some of these suggestions! I always overthink it. These photos are breathtaking! I really love the second outfit, that top is just amazing! Your photos are stunning! I love the white dress, and the green location! Great tips! These photos are amazing and I love your outfits. Absolutely adore these pictures. You look STUNNING. Love how you kept it simple with a white dress and switched it up to the gorgeous navy look.